The Click n Curl Value Set allows you create a set just right for you by mixing and matching sizes and sets. The Value Set allows you to purchase one Full Set of any size along with one Expansion Kit of any size for less – giving you 8 rollers, 1 universal handle, 3 clips and 1 travel bag. 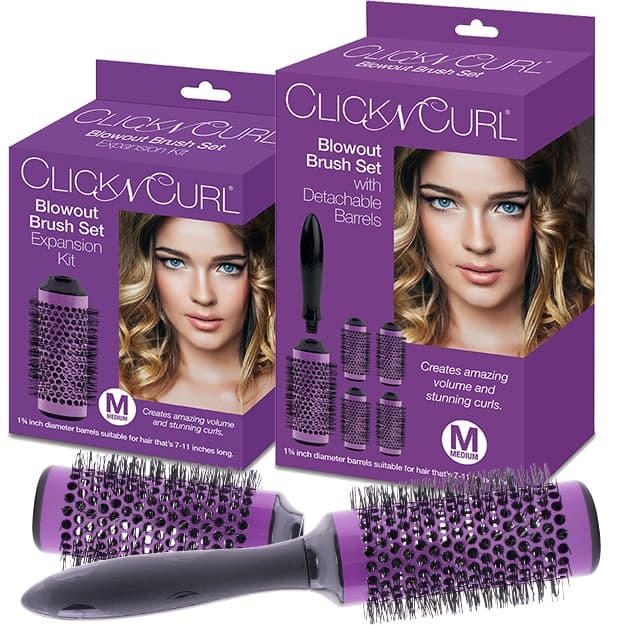 Click n Curl Blowout Brush Sets are the secret to a glamorous salon quality blowout (a style that is synonymous with royalty, models, movie stars and socialites) complete with amazing volume and stunning, loose following curls. 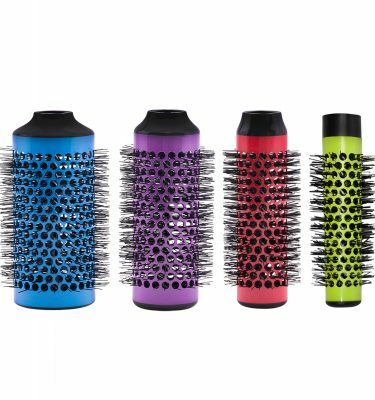 This unique styling tool is as easy to use as a conventional round brush but produces superior results and can cut your hair styling routine in half. 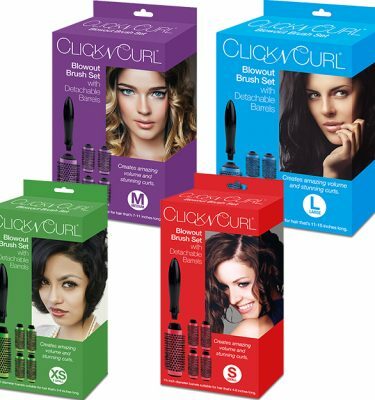 The key to Click n Curl’s long-lasting style is the ceramic-coated detachable barrels, which heat up with a hair dryer and then remain in the hair to cool. Holding the desired shape until your hair has completely cooled is what sets the curl and creates results that last. Unlike other styling tools that require you to dry first then style, Click n Curl allows you to dry and style at the same time, producing simply remarkable results. 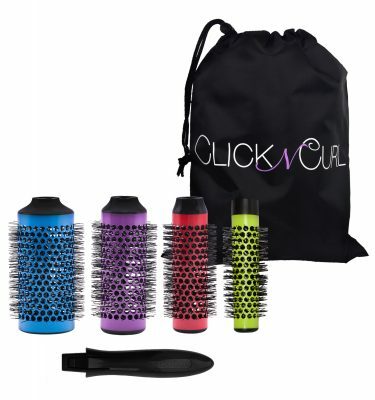 When using Click n Curl, do not place hair dryer directly on the brush barrel, brush bristles or the hair. This could result in damage to the brush and/or the hair. The heat source should be a minimum of 2 in. / 5 cm away from the brush barrel and remain in constant motion to avoid excessive, constant, direct and prolonged heat on the hair. Click n Curl is not suitable for extremely long hair. Please do not attempt to use this product if your hair is longer than 15 inches. 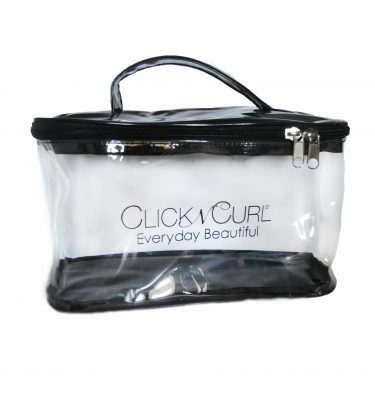 Just had to write and review this product after trying the Click n Curl brush/rollers. I love them. They allow you to style your hair as you finish drying without an additional step of having to then use electric rollers. And the added plus is that you get much more volume and a smoother look to your hair. It also makes your style last longer because it seems to lock in as the rollers cool. Kind of how you would use the cold shot on your blowdryer to lock in your style. But in this case you don’t just have to stand around wasting time while it cools you can finish getting yourself ready. If your on the fence don’t hesitate. The people at Casual Panache,Inc. are great to order from and the video will help you determine the size you need. The value set is the perfect amount of Click n Curl brushes. I got two different sizes so I could mix n match volume & curly style! <3 Would definitely recommend this purchase.